Hamilton liked to capitalize on the designs of models and make new models using the same parts. 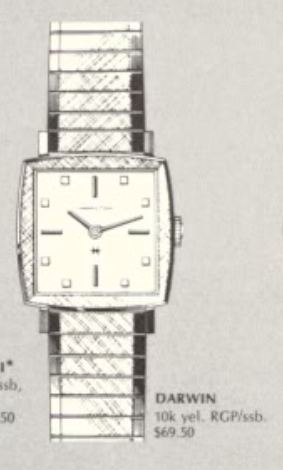 If you've seen any of the Lord Lancaster models with diamonds on the dials, then you probably have noticed that the designs echo other models in Hamilton's line up. There are lots of examples but lets just use the Lord Lancaster K from 1966. The Lord Lancaster K is based on the 1965 Darwin from the prior year. The Darwin was produced through 1969. The Darwin came with a 10K RGP and stainless steel back. It came only in yellow in 1965 but in 1966 it also came in white gold RGP - just like the Lord Lancaster K.
Tucked inside the Darwin is a Hamilton 681 manual winding movement. It's one of the few men's models that doesn't have a second hand. I recently picked up a Darwin and it caught my eye mainly because it came with it's original bracelet. It was filthy and a bit beat up but was otherwise in decent shape. Without the crystal in place, I can see the dial is actually very nice. The 681 is a very small movement for a men's model. I couldn't find a glass crystal so I went with an acrylic option made by GS. Acrylic crystals are easier to work with than glass and although they scratch more easily, they can also be buffed clear again. Once glass scratches, it's permanently scratched. The movement is back together and all that's left on the back side is the balance assembly. Then it's off to the timer. Well, something inside is making a little extraneous noise. So I'll remove the balance and reclean it. Getting warmer... I adjusted the beat error and have it dialed in fairly well but one more trip through the cleaner will get rid of of the occasional blip on the timer. A new crystal and a trip through the ultrasonic works wonders on the appearance of this Darwin. The bracelet still shows it's age but it turned out pretty well. This is a tiny watch though and probably better suited to a woman by today's standards.